Mercedes-Benz has crowned its recently introduced S-Class Cabriolet line-up with a plush new limited edition Mercedes-Maybach S650 Cabriolet model. Revealed at this week’s Los Angeles motor show, the luxurious four-seat open-top is planned to go on sale in the UK during the second quarter of 2017 at a price well above the £193,900 of the Mercedes-AMG S65 Cabriolet, with which it shares its V12 petrol engine. To be produced in a limited run of 300 - each with its own individually numbered key ring and certificate signed by Mercedes-Benz chairman Dieter Zetsche, the S650 Cabriolet heralds in a new “650” model nomenclature that is also set to be adopted by other V12-powered Maybach models, according to senior Mercedes-Maybach officials. 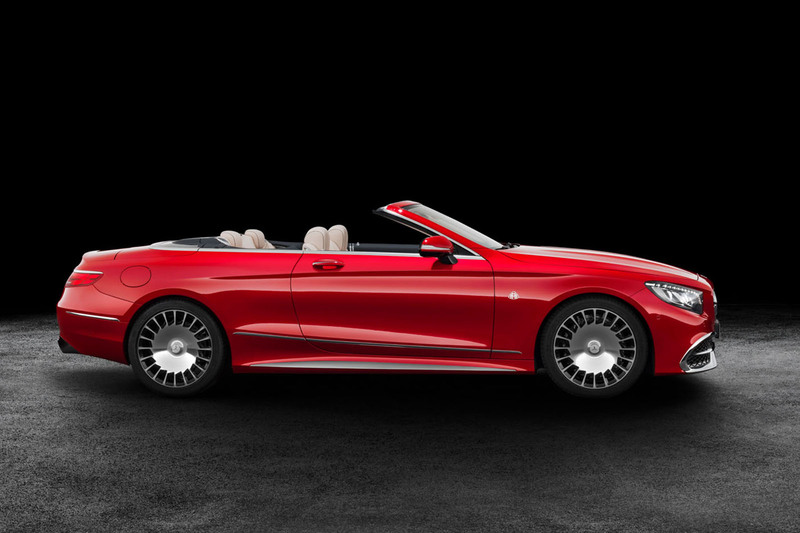 The S650 Cabriolet retains the same predominantly aluminium bodyshell as other open top S-class models but adds a limited number of distinguishing design features. Included is a front bumper featuring a restyled lower section largely in chrome, standard Swarovski crystal encrusted headlamps, unique 20-inch alloy wheels as well as Maybach badges within the grille, front fenders, lower boot lid and atop the tonneau cover at the rear of the cabin. Upon opening the doors, an entrance lighting function projects a Maybach logo onto the ground. Exclusive interior elements include nut brown magnolia trim, 1 of 300 lettering on the cup holder, Maybach logos within the steering wheel, seats, rear of the head rests and centre console. All of the options available on the S-class Cabriolet are fitted as standard, including the Airscarf neck ventilation and wind reducing Aircap systems. Mercedes-Maybach has also developed nine new interior colour combinations for the interior of its latest model and will supply its new model with a standard quilted car cover with Maybach identification. Another standard feature on the new S650 Cabriolet is a bespoke luggage set. It comprises of two larger and two smaller bags fashioned from the same grade and colour of leather that Mercedes-Maybach uses for various interior appointments. Tailored to fit the boot, the bags can be attached to each other with straps to enable optimum use of the luggage compartment. Power for the S650 Cabriolet comes from the same twin-turbocharged 6.0-litre V12 petrol engine used by the Mercedes-AMG S65 saloon. Assembled on a newly established production line at Mercedes-Benz’s engine factory in Mannheim, Germany, it delivers 621bhp at 4800rpm and a stout 737lb ft of torque between 2300 and 4300rpm. The heady reserves are channelled through Mercedes-Benz’s seven-speed 7G-Tronic automatic gearbox to the rear wheels. No official weight figure for the plush new open top has yet been revealed, though Mercedes-Maybach quotes a 0-62mph time of 4.1sec and limited 155mph top speed. Unlikely to be of any great significance to prospective customers, the combined cycle fuel consumption put at 23.5mpg, providing the S650 Cabriolet with average CO2 emissions of 272g/km. Underpinning the S650 Cabriolet is a specially tuned version of the AirMatic air suspension system seen in other S-class Cabriolet models. In tastelessness, without parallel. Who on earth would want to be seen in one of these? You know the old joke about the only person ever to have looked good in the back of a 4 seat convertible? I don't reckon even he would have picked one of these. The inside is as nice as the other Mercedes products but whoever thought those alloys and that horrible silver lined front lower grille were attractive should be shot, or at least given an eye test. At the same time, is a certificate signed by the boss of a luxury car manufacturer really something anybody cares about? Get it signed by Hamilton, Rosberg, or even Niki Lauda and it might be worth the paper it's written on. Take donor car, add new badge, charge more money…you really couldn't make it up. The gullible are waiting with their credit cards for you now. Wonder how much the certificate costs given the hourly rate of the chief execute to sign 300, must be great use of his time.